Oil on canvas: 40 x 31 1/2 in. 101.5 x 80 cm. Although celebrated as a painter of monumental horse portraits, Wootton practised landscape painting throughout his career for a different, and probably more fastidious, clientele. After studying under Jan Wyck and probably Jan Siberechts, he visited Rome in the early years of the eighteenth century, and like the patrons for whom he was later to work, was strongly impressed by the classical landscapes of Poussin, Dughet and Claude. Their Virgilian mood was one which Wootton was perfectly able to adapt to his own idiom, so that in his landscapes of the 1720’s onwards he created an Augustian idyll which neatly responded to the model of Gaspard Dughet. By 1722 Vertue commented that Wootton had “perfectly entered into Gaspard Dughet’s manner”. Wootton was adept at evoking some of the rustic wildness of Dughet’s vision; less cerebral than Poussin and less luminous than Claude, whose coastal panoramas he did indeed imitate in the late 1740’s, Wootton’s landscapes of the 1720’s and 1730’s show a rugged energy, with bush-like foliage and straggling branches bursting untidily from all sides of the view. The mood of the scene reflects the sytle, in untamed form, of contemporary landscape designers such as Bridgeman and Kent. As at Stowe or Painshill, the view is peopled with classical references, urns, monuments, pyramids or statuary giving way to campagna-like towns the distance, a repertory of broadly executed classical rustics, sages, shepherds and travellers with attendant flocks animating the foreground. An exhibition of Wooton’s landscapes and sporting pictures was held at Kenwood in 1984. His famous series of equestrian portraits are well represented at Badminton, in the collection of the Duke of Beaufort, and at Althorp, the seat of Earl Spencer. 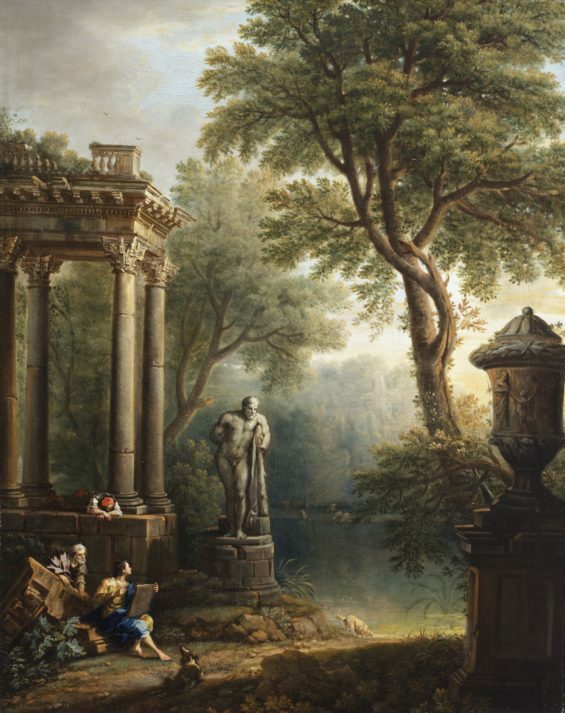 I am writing to enquire about "A Capriccio Landscape with an Artist sketching the Farnese Hercules beside a classical temple"